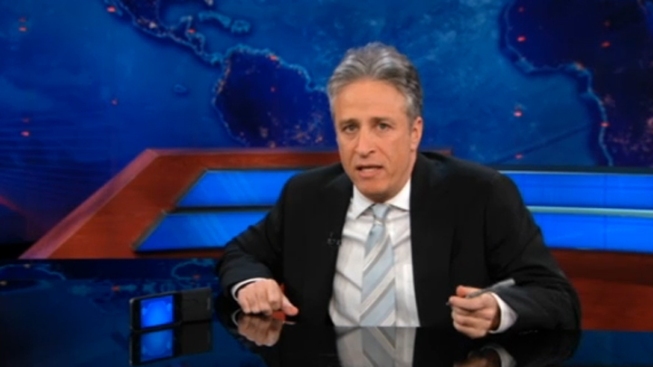 Jon Stewart: "Romney's Election is Fox's Job"
"It's not gonna be a slam-dunk because during the primary Romney's nomination was not unanimous." Jon Stewart and Siri have a heart-to-heart about Foxconn. On Thursday's edition of "The Daily Show," Jon Stewart mocked a handful of Fox News political pundits for suddenly changing their tune on Mitt Romney. During the early days of the GOP nomination battle, many high-profile conservative commentators — Sarah Palin among them — expressed reservations about Romney's candidacy. Some even outright disdained the former Massachusetts government's presidential bid. But now that Romney has emerged as the inevitable Republican nominee, Stewart noticed that many of Romney's sharpest critics have become his most vocal supporters. And Stewart, naturally, takes issue with the sudden political pivot—and finds the recent Romney-fest pretty disingenuous. "It's like how vegans sell you on tofu," he joked. "I know it tastes like [expletive], just put enough rice and soy sauce in there, you barely even know you are eating curdled soybean, it will be fine."